A pictorial tribute to all the volunteers. Thank you for your invaluable help in 2014. Happy New Year. Here's to an enjoyable 2015. With winter fast approaching, and frosty evenings and mornings more than likely not far behind, it was our last chance to plant bulbs. Some 12,000 bulbs where destined for a large bank above the main car park at Aira Force. The old path has been re directed and a number of large trees removed. This has meant that over the summer months the grass has started to grow again. With the help from donations given to the National Trust, we where able to purchase a mixture of Bluebells, Snowdrops and daffodils, all locally sourced and all native to the UK. 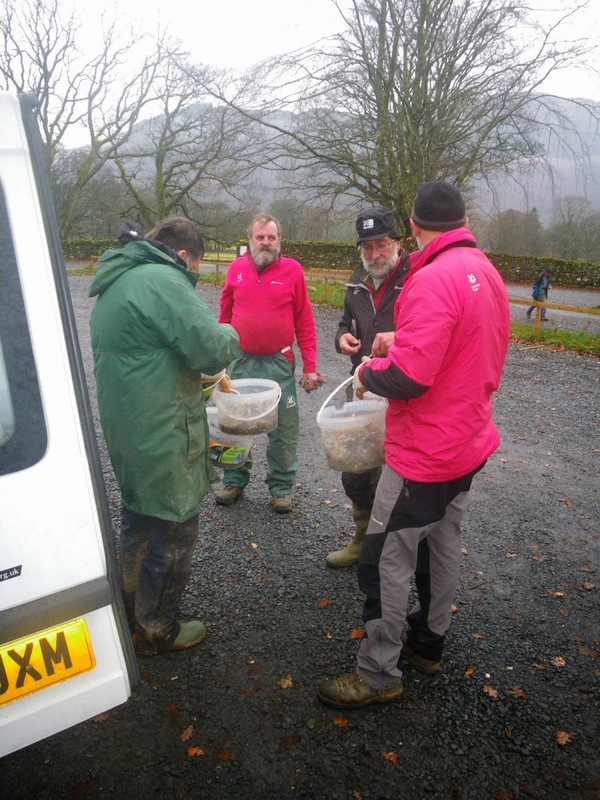 With 12,000 bulbs and only a small team at Aira Force, we called for help far and wide and we weren’t disappointed. We where assisted by volunteers, rangers from other parts of the property even our sales assistants where happy to lend a hand. Its amazing how so many bulbs can look so small when they are bagged up, but believe me when you have made over 2000 holes it doesn’t seem like a small amount. The bulbs where divided up and we spread out over the bank. We had customised some old branches to be ‘dibbers’ (basically sharpening the end of the branch to a point), they where used to make a 2 inch hole in the ground. Then a bulb could then be dropped into the hole, ready to burst into life next spring. The team worked extremely hard over two solid days, there was a plan a foot to plant the bulbs in some sort of design on the bank, but in the end it was hard enough to remember where we had been. So if you are around Aira Force next spring, please drop in to view the explosion of colour that will be adorning the large bank in the main car park. We look forward to seeing you. To celebrate National Tree Week, the Ullswater Rangers with lots of help spent a week planting native trees near to the village of Hartsop. National Tree Week ran from November 29th to December 7th and had people up and down the UK getting involved with organised tree planting days. 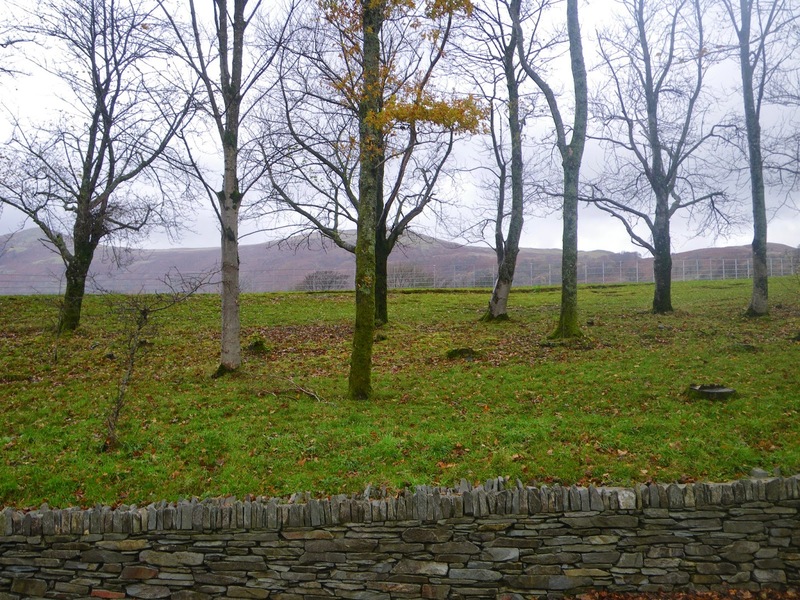 Here in Ullswater we saw the perfect opportunity to time a large tree planting scheme with this event as a way to attract help from the local community and from our own volunteers and staff. The village of Hartsop is situated south of Ullswater at the foot of the Kirkstone Pass and is a popular route for walkers to take when visiting Hayeswater. The village is nestled amongst steep sided fells and looks across to Brotherswater - a SSSI for its wetland edge habitat, and to Low Wood - a Special Area of Conservation (SAC) for its oak woodland. Taking a well earned break, gazing across at Brotherswater and Low Wood, at the foot of the Kirkstone Pass. On a bracken covered hill behind the village a Natural England HLS (Higher Level Stewardship) Grant had been agreed to help plant up the slopes to revert it back to scrub with occasional maiden trees. There is a remnant of this habitat in the form of isolated hawthorn trees, holly, sycamore and ash which had managed to get through the dense bracken and avoid the palate of deer and sheep. The hillside was south-facing which meant it was ideal for the pioneer tree and shrub species which are often light demanding. The warmth and light would also lengthen the growing season and make it a perfect habitat for invertebrates and even reptiles that rely on the sun's rays to become active. Facing the sun, the planting site became quite warm even in December! A holly planted and ready for its protective tube. All were in the 40-60cm height bracket. We have tried planting taller trees but these seem struggle to become established, perhaps there is a bigger amount of stress put on the root system of the bigger trees when dug up from the nursery. Then I needed to order the plastic tubes to put around the planted trees. The site is in the process of being fenced out from deer and sheep, however the bracken will nearly be 2 metres high in summer so the trees need to be found, be protected from the weight of leaning bracken, be safe from harm when the bracken is slashed down in summer, and be in their own micro-climate away from drying and chilling winds. The trees were going to be planted in 1.2m high Tubex tubes using 1.5m wooden stakes, and the shrubs would be planted in 0.6m high Tubex Shrub tubes (a wider diameter) with 0.9m stakes. Oak is quite light demanding and I would normally be unsure about planting them in tall, narrow tubes (sometimes I use two shrub tubes - one on top of the other) but because the site was south facing I felt they would receive enough sunlight through the plastic to get growing. Volunteer David is holding the wider diameter shrub tubes, while the trees behind are in the taller but narrower tubes. 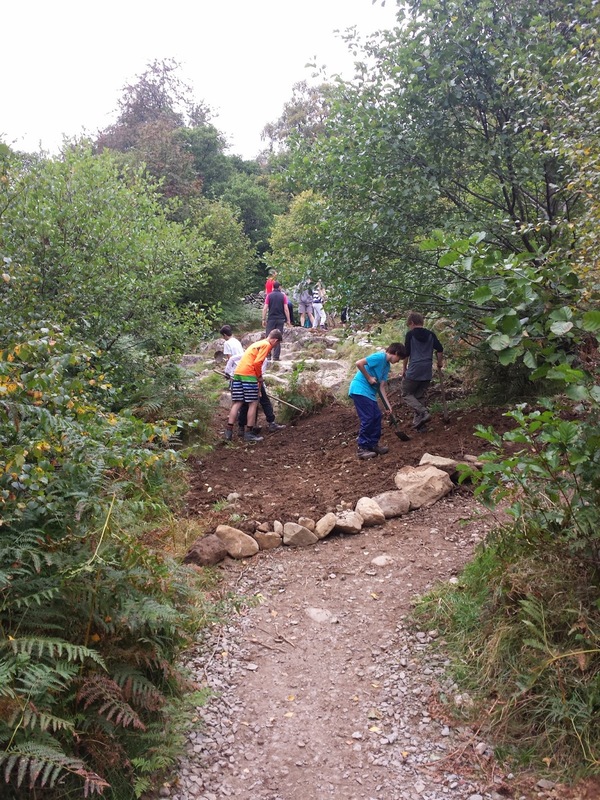 The Woodland Trust who have been very busy planting up other areas around Ullswater and the Lake District very kindly offered to contribute to the planting project. The tree tubes came curtousy of Pete Leeson of the WT, which made up for a shortfall in the grant. Once all the materials had been delivered we set about getting them as close as possible to the planting site, to reduce the amount of walking and carrying on the actual planting week. Luckily there is a footpath that runs along the top boundary of the site so the tenant farmer and his son kindly helped by using a John Deer RTV and a quadbike & trailer to ferry the materials up to the top of the site, and spread along the boundary ready to be used. Dropping off the materials needed a long drive with a loaded trailer, then a long ride on a RTV to the top of the site. In hindsight however, I should have dropped off more materials at the bottom, because even with gravity on our side the journey down-slope with heavy stakes was pretty tricky at times. With all the materials on-site and the word spread around, it was time for Ullswater Tree Planting Week 2014! Help arrived in the form of the Eden Rivers Trust Apprentices, led by Susie Grainger and is linked to Newton Rigg college in Penrith. Susie arrived with 4 of her apprentices - Toby, Anthony, Andy and Kirsty - who promptly set about knocking stakes in the ground and planting trees. This was easy work for them as they'd done upland tree planting with the Lake District National Park only a few weeks ago. The troops started to gather at the bottom of the site, ready to be fuelled up with mince pies and tea! More help came from local volunteers - Richard, Dave, Alan, David, Sally, Jan and Mike. Regulars at lending their spare time to the National Trust these folk made a real difference and they loved being in such a beautiful location. In fact, this is by far the most stunning location I have ever planted trees, and perhaps will never have such a great view when leaning on my tree planting spade ever again! We were very lucky with the weather, and the view was breathtaking. On the home team, Steve, Dave, Nic and John all helped out during the week and must have climbed the long steep journey from Landrover to material piles enough times to equal an Everest attempt! Finally the Aira Force team, led by Audrey were able to take a break from the busy visitor duties to come out and plant their '50'. I had worked out earlier in the week that if everybody planted 50 trees in a day then we might have the job finished in a week. As it turned out that was a little optimistic due to the very steep nature of the site, the dense bracken, the short days, and the need to carry the posts and tubes down to where we were planting. The week was a success. The weather couldn't have been better, especially since we're in Cumbria, in winter, and at altitude! Perhaps it was because we were closer to the sun but it was warm enough to be in t-shirts for a couple of the days. The ground also was lovely soft soil beneith the bracken litter with only a few stones found along the way. There were breakages - knots in the stakes meant about 20 broke whilst being knocked in. Did I mention the steepness of the site?! A lot of time and vital energy would be wasted by walking up and down the slopes and any unessessary moving around had to be avoided. Teams were essential. Individuals could not plant the trees and guard them up alone, there would be too much to carry, be lots of putting down and picking up different tools and importantly was not safe on a site that had steep drops and limited phone signal. After I had made pilot holes and Dave had knocked the stakes in, Mike then planted the trees and Katie put the tubes on. We got into a great rhythmn with 4 people. The first carried some stakes and a metal bar, made pilot holes and placed stakes in them. Next the 2nd person would knock the stakes in, and carry along more stakes. Behind them the 3rd person would make the slot for the tree with a spade and plant it, then the 4th person would carry bundles of tree tubes and put these on the tree. By working like this we all moved along in sequence and it became a smooth flowing process. Importantly no-one was speeding off ahead which usually results in stakes being missed, trees not planted or tubes forgotten to be added. The author, planting a rowan. The pass in the background leads to Troutbeck Park. In the end, about 1200 trees were planted in the week taking 170 person-hours. An avaerge of about 7 trees and hour, and the days had around 5.5 hours of actual planting time so that gives 38.5 trees per person, per day. A little short of my 50, but a superb effort considering the, erm, slight incline. One day in the week that followed was spent by Steve, Dave, Nic and I planting the last few trees and shrubs and collecting any leftover tools and materials from the site. The weather was a complete contrast to the following week and we all had to battle on through cold, wet and windy weather. But we did it, a massive thanks to them for that day and the week before. The following week was more typical Lake District - wet, cold and very windy. Steve counting the last few trees as Nic and Dave make yet another ascent to the top. The day after we finished, it snowed. Hartsop village can be seen at the foot of the hill, above it amongst the dead bracken is the planting site. All 1320 tubes became invisible in the light snow. Time is always limited and I'm sure I could have organised some finer details better, such as the dropping off of materials, the exact locations of some of the trees, and the planting styles used. However all the trees were planted, the right way up, with tubes on, and in the right location, which makes me very happy. Thanks again to all those who came along. Please join me in 2015 for more! 'Tis the season to be repairing..............accident-damaged-roadside-walls. Yet another roadside wall needing repair, this time on the A591 at Jenkyns Field. National Trust. This was a typical "hit and run" and incidents like this are all too commonplace. Unless the vehicle is too badly damaged to drive away, the driver will rarely report the accident or admit to causing any damage. The wall as seen from the field side. The dislodged stones are scattered on the grass in the foreground. Straightening out the stones. Sorting out the mess prior to rebuilding. Cementing on the top/cam stones. Another repaired wall...still quite a few to do and doubtless there will be even more to add to this list before long! To The Rescue of a Tree and a Footpath! This bank by the side of Windermere, on which a medium sized oak is growing, periodically becomes extensively undermined when water levels are high. The footpath at Millerground runs directly behind the oak, and it too is threatened by this rapid erosion. If the tree fell, the substantial root plate would rip away the path it is growing under. For the sake of the tree and the path urgent work was needed to save them both. Tons of stone were used to fill in the large cavity (it was possible to crawl right under the tree) in the hope it would give the tree and the path some stability. While the cavity was being filled large stones were used for pitching up the bank at an angle to take away some of the force of the wave action. The work is well under way here. Millerground (as mentioned in previous posts) is a difficult place to work as access is so restricted. Power barrows were used to fetch in the stone, a time consuming job but the best option! These power barrows really come into their own on jobs like this...of which there are many.. and it is difficult to imagine just how tough it would be without them. Work almost complete. A lot more confidence now in the tree and the path staying put! A female mallard took an interest in what was going on from an unusual vantage point. Seen enough. Really must fly.